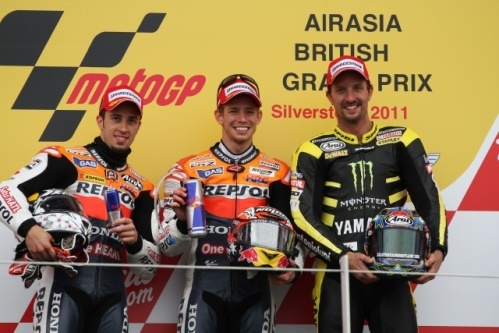 A crowd of just under 73,000 were at Silverstone on Sunday for the 2011 AirAsia British Grand Prix, where Repsol Honda rider Casey Stoner celebrated his fourth win of the MotoGP season and his first British Grand Prix victory at the Northamptonshire circuit. The Australian rider was joined by team mate Andrea Dovizioso and American Colin Edwards on the podium, after a number of riders fell at a wet and windy Silverstone. More than 157,000 fans were at Silverstone over the three days of the event: 32,054 attended on the Friday (up almost 25% on last year’s Friday crowd), while 53,110 headed to the circuit for qualifying on Saturday. Attendance figures were up on all three days of the 2010 event, despite the inclement weather on race day. While Stoner stole the headlines in the MotoGP class, the British crowd was also treated to a podium finish by British rider Bradley Smith, who rode a stunning race to finish second in the Moto2 race, after starting at the back of the grid. Brits Scott Redding and Danny Kent also put in strong performances in front of their home crowd, finishing fifth and tenth in the Moto2 and 125cc races respectively. Away from the track, a number of celebrities added even more glamour to the occasion, including the only man to be crowned World Champion on both two and four wheels, John Surtees OBE, five time MotoGP World Champion Mick Doohan, F1 World Champion Nigel Mansell OBE, actor Ewan McGregor, former athlete Iwan Thomas and singer Shane Lynch. In addition to the impressive on-track action, with the riders pushing as hard as they could in the wet conditions, fans were treated to a world class line-up of free off-track entertainment. More than 4,500 fans stayed behind on Saturday evening to see almost all of the MotoGP riders interviewed on a giant stage in the Arena Entertainment Zone, while further entertainment ranged from stunt shows, concerts and aerobatic displays, to on and off-road riding experiences. Richard Phillips, Managing Director of Silverstone Circuits Limited, said: “It’s been a fantastic weekend for Silverstone, despite the weather conditions on Sunday. Early feedback from the fans has been extremely positive and I can’t praise them highly enough. They’ve had to endure some pretty miserable weather today, but they’ve turned out in force and enjoyed a great event. Attendance figures were up on all three days, and we were particularly pleased with the increase on Friday. More fans are making the most of the three-day tickets and official camping facilities.